My first foray into blogging….I am one of the Trudie Alfred Bequest recipients and Vicki , the editor of JAC, thought it would be good for the five of us to share what is going on with our ceramics as the year develops. So I am quite shocked to realise the first semester of my honours year has nearly slipped by. Like the other recipients, I have been buried deep in trying to forge new directions with all the uncertainty that goes with developing new ideas. 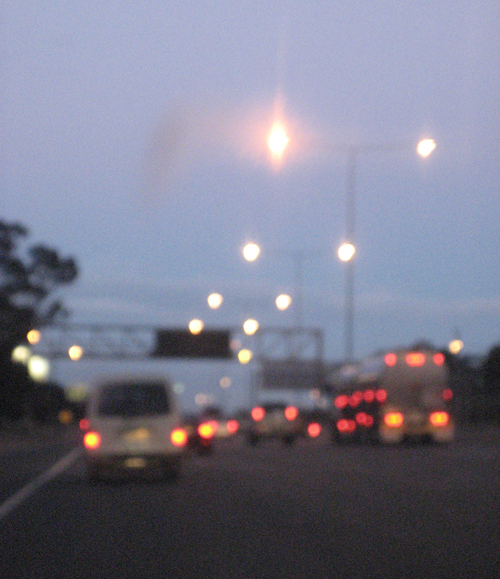 My work is centred around the experience of travelling, particularly the experience of driving, often at night, along Melbourne’s vast freeway networks. Although I live in Melbourne I study in Ballarat and the drive has become familiar and at the same time mesmerising. I have taken a lot of photos trying to capture just what is it that attracts me. This particular photo has been one of the key images for my work this year. I have wrestled with developing a unity between the form and the imagery and after a number of maquettes I feel I finally could be making some headway. I will be glazing some larger pieces next week which hopefully will give me some feedback for the next step forward. My first foray into blogging….hi, I’m Janetta Kerr-Grant, one of the Trudie Alfred Bequest recipients and Vicki , the editor of JAC, thought it would be good for the five of us to share what is going on with our ceramics as the year develops. So I am quite shocked to realise the first semester of my honours year has nearly slipped by. Like the other recipients, I have been buried deep in trying to forge new directions with all the uncertainty that goes with developing new ideas. My work is centred around the experience of travelling, particularly the experience of driving, often at night, along Melbourne’s vast freeway networks. Although I live in Melbourne I study in Ballarat and the drive has become familiar and at the same time mesmerising. I have taken a lot of photos trying to capture just what is it that attracts me. This particular photo has been one of the key images for my work this year. I have wrestled with developing a unity between the form and the imagery and after a number of maquettes I feel I finally could be making some headway. I will be glazing some larger pieces next week which hopefully will give me some feedback for the next step forward. Having not long returned from an extraordinary NCECA Conference in Seattle, I think I am finally coming back to earth. I have seen so very much and listened to equally as much that I am only really now feeling like I can digest it all. There was a long and extensive range of lecture subjects but my personal favorites were talks given by Jae Won Lee and Patti Warashina and demonstrations by Tip Tolland and Walter Keeler, all for their endearing honesty and outstanding work. In truth though, the manufacturer’s hall had me astounded and that was just the start. Apparently there was over 190 exhibitions to see and around 5000 conference participants to see them! It was great to see some Australian work; Gail Nichols, Vipoo Srivilasa, Barbi Loch Lee and to have the opportunity to meet Janet De Boos who was there to lecture and represent ANU. The most outstanding exhibition for me was PushPlay: 2012 NCECA Invitational. A collection of technically and conceptually brilliant works by 34 artists asked to respond to the relevance of play in contemporary life and its connections to art, creativity, technology, individuality and community. 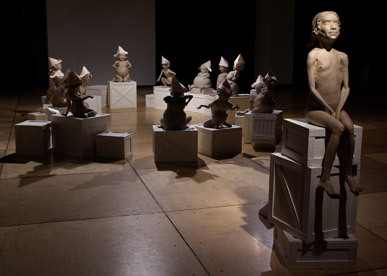 A personal standout was Anne Drew Potters’ circle of ostracizing girls in terracotta. Anyone with “young blood” out there? It would be great to see some ceramics at the Young Blood Markets in July! Applications are via the website above and close on 14 May 2012 and applicants will be notified if they have been successful on 1 June 2012. They can also sign up to the newsletter from the Young Blood website link & select ‘design’ as their interests so they can receive any news regarding design orientated events at the Powerhouse. Hello from one of the Trudie Alfred Bequest recipients, Serena Rosevear. The first six weeks of semester have slipped away, immersed mainly in researching, thinking and writing. I’m exploring the use of digital technologies as a tool in my practice through my Honours project, contrasting this to my ‘traditional’ practice, hoping to draw a deeper understanding of what it means to be a maker at this point in history. My project has made a slight shift, as they always do, and I now have a clear idea of the central question I am trying to answer: What are the qualities which define objects as ‘handmade’ in the digital era? I’ve also been finishing off some work in my studio which, though not strictly part of my Honours, has been feeding into that jumble of ideas I have been processing. The work (pictured) is a recently completed commission for a local coffee shop, wheel-thrown from Cool Ice, unglazed but polished on the exterior, glazed interior. The exacting task of making 50 consistent forms lead me to question, with my perfectionist tendency and the refined design, whether I was retaining recognisable evidence of my hand in their production. What is it that says “handmade”? Four ceramic figures each titled, Souvenir (of) Tahrir Square recently acquired by the museum are rare tangible items able to document the momentous but intangible impact of social media. The Souvenir (of) Tahrir Square figures are named after the public square in Cairo that was central to the Egyptian democracy protests throughout 2011. The figures are vintage porcelain ornaments, dramatically altered by Byrne, to become politicised statements celebrating free speech. News from HQ – Do you sell work on consignment? With the retail sector suffering in this hard economic climate this is important news for all ceramic artists/designers that sell their work on consignment. Australia’s new Personal Properties Securities Act requires that you register a security interest in your personal property [ie artworks and products] to protect yourself from loss in the case that any gallery/retailer holding your work were to fold. For more information go here. Author Australian CeramicsPosted on March 9, 2012 June 1, 2016 Categories All Ceramics News1 Comment on News from HQ – Do you sell work on consignment? 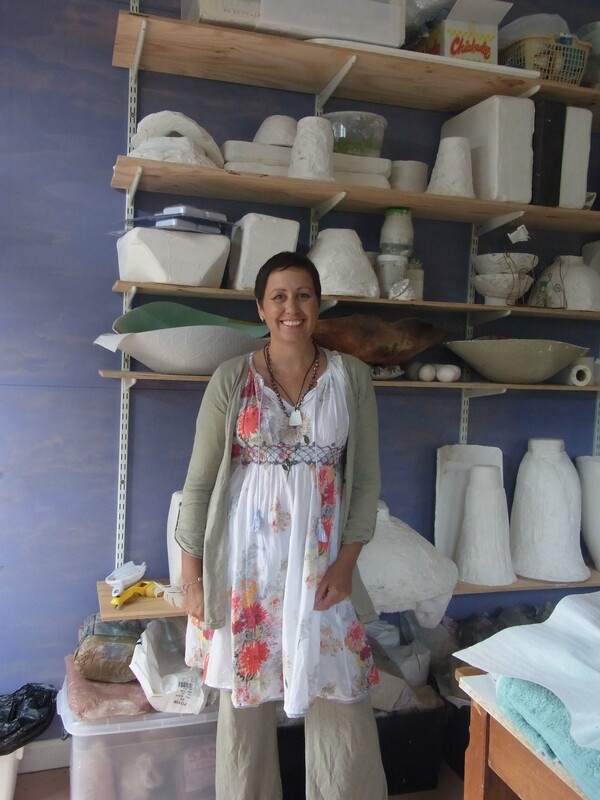 To introduce myself – I am Tracey Mitchell, emerging ceramicist, Trudie Alfred Bequest recipient and fledgling blogger. As a Scholarship receiver for 2012, the year has started off with an enthusiastic flurry –balancing work and family with my studies and ambitions – it is all very exciting. My intention is to immerse myself in learning and to endeavour to get the most out of all opportunities that come my way. I have eagerly embraced the start of an Advanced Diploma in Gymea TAFE, keen to begin a new path exploring sculptural form in more detail. I have set myself the task to take my hands off clay for a short time and to process in a deeper way, what I would like to express and how best to do it. I have also been given an opportunity to attend NCECA (National Council on Education for Ceramic Arts) Conference in Seattle this year and with every updated conference/exhibition schedule, I get more and more excited, so it’s just as well I leave in 2 weeks! I hope to meet some other Australians whilst away and having never been to USA or NCECA would be eager for any advice or feedback. I look forward to the challenges and hopefully growth, which 2012 will bring. If you are looking four walls for inspiration or wanting to learn new skills to enhance your existing practice then the following two workshops may be just the creative tonic you need. 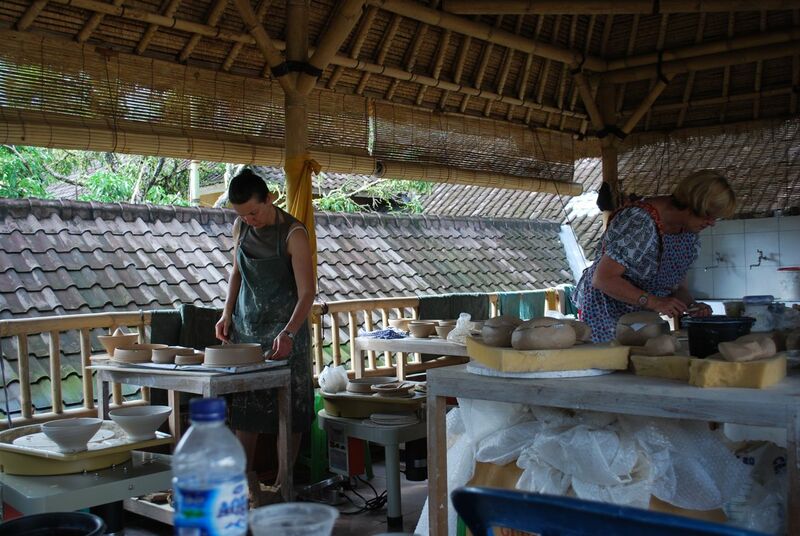 Culinary Clay: Food and Design at Gaya Ceramic and Design located in Ubud, Bali from 8 – 21 April 2012. Returning for it’s third incarnation, this is a remarkable workshop for any clay-lover with a specific interest in the intimate relationship between food and the vessel in which it is presented. Formal design considerations of shape, texture, color and scale will be explored in direct relation to specific unusual gastronomic selections. Participants will work closely with Hillary Kane, ceramic instructor and visiting culinary expert, Mary Jane Edleson, creating utilitarian pieces as well as sampling and preparing the exquisite recipes that will be served upon them. The two-week workshop will culminate, appropriately, in a feast of the senses. Peter Cooley’s polychrome ceramic sculptures bring you closer to the wild otherness of the avian species than any visit to a zoo ever could. Cooley’s unique forms of discontinuity in space refuse to capture, but manage to ‘get’ the fast twitter flutter peck of “birdness”, on the bough and in the air. Cooley’s encounters in Through the Archipelago seem more real than the deconstructed blurr of a fast shutter speed “wildlife” photograph taken with a telephoto lens. Modernist to their evacuated cores, Cooley’s masterful painted majolica glazed ceramics continue sculptures redemptive synthesis of colour, texture and form that Picasso got going in the early 20th Century with oil paint on bronze in his six variations on A Glass of Absynthe, cast from hand modelled wax. Congratulations to the inaugural winners of The Trudie Alfred Bequest Ceramic Scholarships 2012 – Amy Hick (ACT), Janetta Kerr-Grant (VIC), Tracey Mitchell (NSW), Serena Rosevear (TAS) and Sharon Thompson (NSW). 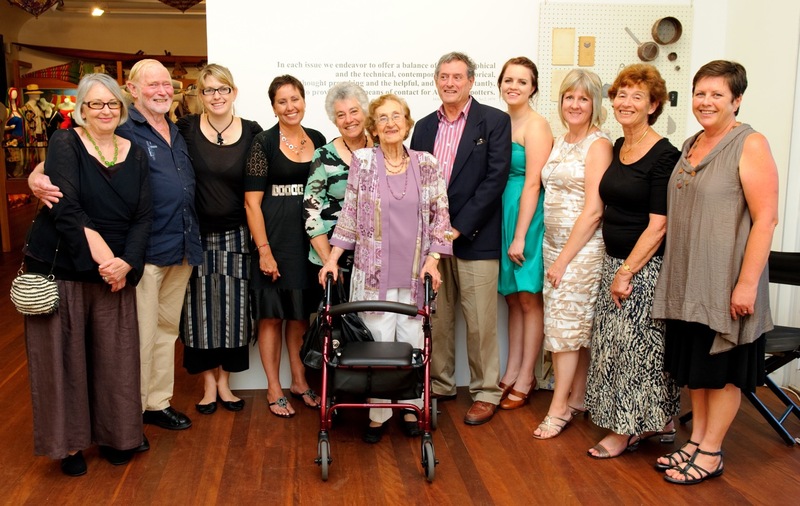 It was wonderful to be able to present the awards to four of the five winners at the celebrations for our 50th Anniversary on 22 January 2012 at Manly Art Gallery & Museum. Each of the five winners received $4000, which will assist them with their ceramics studies at a tertiary institution in 2012. Welcome to the Australian Ceramics blog! In 1956, the Potters Society of Australia was formed to encourage and foster the development, appreciation and recognition of potters and pottery. It was the first ceramics organisation in Australia. In 2006, our name was changed to The Australian Ceramics Association to more fully reflect the scope of practice of the members. We are a national, not-for-profit organisation representing the interests of practising potters and ceramicists, students of ceramics and all those interested in Australian ceramics. We actively support and promote quality, specialist ceramics education nationally. Author Australian CeramicsPosted on February 22, 2012 June 1, 2016 Categories All Ceramics News1 Comment on Welcome to the Australian Ceramics blog!